What is Bin the Bin? Bin The Bin reflects the environmental and energy conscious policies being adopted by more and more organisations around the capital. It’s part of a bigger picture to show real commitment to cut down on the amount of plastic bin bags that we use in everyday life. It aims to improve the quality of our recycling rates and thereby reduce the impact of our lives on the environment. The concept involves people making a bit more effort to dispose of their rubbish. Experience has shown that when staff take a few moments to think about how much environmental damage is caused by plastics, they are more likely to take the extra steps, (across the office that is) to use recycling points. Consequently, Bin The Bin is more than just the removal of the bins from the office. It’s a carefully structured campaign designed to change the mindset of people, which brings staff on board from the beginning. It points out the damage caused by the careless disposal of rubbish without fussy language. It shows them that a difference can be made with very little extra effort, backed-up by simple to follow instructions, clear labelling and so on. Even more important than bringing people on board in the first place though is to keep the recycling momentum alive. This is aided by the use of a sophisticated online monthly feedback system that allows the auditing of waste recycled through the scheme as both raw data and customer friendly comparisons (the difference between recycling 100kg of paper and saving two trees). Staff can now see the difference that their recycling efforts have made. It also provides useful data in company literature to show environmental management improvements, all of which will be authenticated by London Recycling. Bin The Bin has created a 10-20% improvement in recycling rates at some of London's biggest companies. This has also lead to clear financial benefits whilst meeting legislation and avoiding fines. If this improvement was seen by all businesses across the capital, we could see an increase in recycling and reduction in landfill of 20,000 tonnes per year. Ever wondered what happens to your desk side bins following a new scheme? We’ve found a new home for them - as containers for plants. 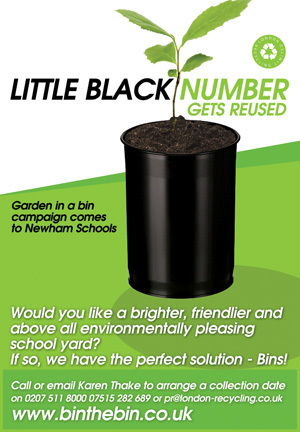 We are offering local schools in Newham the chance to come and collect bins for various planting projects. The bins are reused; plants brighten up schools and get kids motivated about nature. Plants also produce oxygen whilst reducing carbon dioxide in the atmosphere.